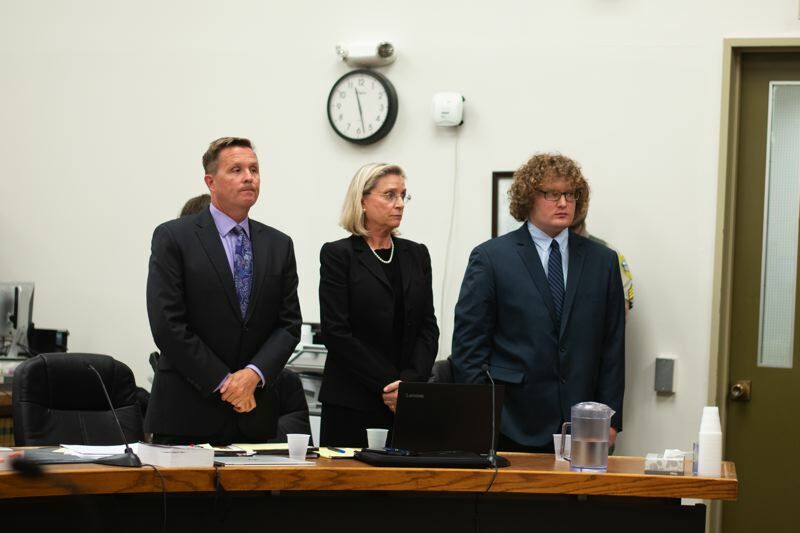 Daniel Armaugh Butts pleaded guilty Tuesday morning to one count aggravated murder and two counts attempted aggravated murder for the 2011 shooting of Rainier Police Chief Ralph Painter. On six other charges, Butts, of Kalama, Washington, pleaded guilty except for insanity. For the murder conviction, Butts was sentenced to life in prison, with the possibility of parole after 30 years. He will also serve time for the two attempted aggravated murder charges, bringing the sentence to life with the possibility of parole after 48 years and 9 months. "To summarize that sentence in one statement, it's life in prison, and parole eligibility will begin when Mr. Butts turns 70," Columbia County District Attorney Jeff Auxier said in court Tuesday. The guilty except for insanity plea on the six other charges, which include property crimes like robbery committed in the same incident as the murder, means Butts will be placed under supervision by the state's Psychiatric Security Review Board. Those sentences will be served concurrently with the three major counts. "The thinking is that he will be returned to the state hospital today," Auxier said Tuesday. Butts will be transferred to the Department of Corrections when the PSRB determines he is eligible. After the shooting, the court determined Butts' mental illness left him unable to stand trial. He was sent to the Oregon State Hospital, where he was treated for schizophrenia and forced to take medication. In July 2018, the court determined Butts was mentally capable to stand trial. Plea discussions began in September. Following hours of discussions over six months, with the approval of Painter's family, Auxier accepted the plea proposed by Butts' attorneys. The judicial settlement conference was led by senior Multnomah County Circuit Judge Jean Maurer, who met with the defense, prosecutors and Painter's family. "It was really important to me that the family have an exceptionally involved role in the resolution of the case," Auxier said after the sentencing. Many of Painter's family members spoke in court Tuesday, recounting the type of father and husband he was and the pain of watching the case drag on. Through tears, Painter's son, Riley, read a letter he wrote to his dad. "I've now had more days without you than I had with you," said Riley, who was supposed to practice basketball with his father the day he died. "I wish you were here to coach me." Riley then addressed Butts, who kept his head down during each family member's statement. "You may have taken my dad's life, but his spirit will live on," Riley said. "No family should wait eight years to have justice for their loved one," Painter's mother, Kathy, said in court Tuesday. "When you murdered him, he had a little boy who was only seven years old," Kathy said directly to Butts. "When you murdered my son, I already had a daughter dying of cancer," she continued. "When you die, you will face another judge. All I can say is may God have mercy on your soul," she said. "Look what you did to your family," she said. "You're young, you had your whole life ahead of you." "Not only did you hurt this family," Kathy added, "but you hurt your own." Many in the courtroom rejected Butts' explanation of schizophrenia. Butts "made a choice, a conscious choice" to take Painter's gun and shoot him, Auxier said. After knocking Painter unconscious, Butts could have fled the scene, according to Painter's brother, Alan, but instead made the choice to grab his gun and shoot him "execution-style." "Eight years of countless hearings, and every time you go to a hearing, you think, 'this could finally be the day this case could change.' But it did not," Alan said in court. "The defense totally seemed to be in control" of the whole trial, he added. Amy, Painter's widow, said Butts has not shown any remorse for shooting Painter, instead focusing only on his own mental illness as a defense. Butts' attorney, Patrick Sweeney, explained that Butts medication inhibited his ability to visibly express emotions like remorse — an explanation met with scoffs from courtroom observers. "There is no penalty harsh enough," Amy said in court. "I believe if given the chance, [Butts] would re-offend."